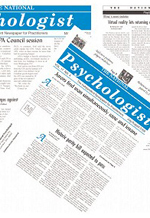 The National Psychologist is a private, independent bi-monthly newspaper intended to keep psychologists informed about practice issues. Contributions and letters are invited. The editor reserves the right to edit articles and submissions for clarity and/or to meet specific space limitations. Publication staff is not responsible for opinions or facts in bylined articles.Disclosure:Financial: The content for this course was published by The National Psychologist.Nonfinancial: No relevant nonfinancial relationships exist.